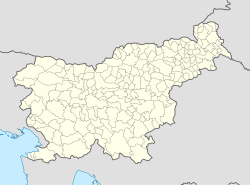 Juršinci (pronounced [ˈjuːɾʃintsi]) is a settlement and a small municipality in northeastern Slovenia. It lies in the Slovene Hills (Slovene: Slovenske gorice). Until 1995 it was part of the Municipality of Ptuj. Traditionally the area was part of the Lower Styria region. The municipality is now included in the Drava Statistical Region. Juršinci in its German form Georgendorf was first mentioned in official documents dating to 1322 and the Slovene name of the settlement, Juršinci, is documented as far back as 1409. The parish church in the settlement is dedicated to Saint Lawrence and belongs to the Roman Catholic Archdiocese of Maribor. The original Gothic part of the building dates to the 14th century, but the church was remodelled in the first half of the 16th century. The municipality has a population of 2,206 (as of 2002[update]). The majority are farmers. Agriculture in the area focuses mainly on viticulture and fruit production. This page was last edited on 8 March 2017, at 00:26 (UTC).